Mikhail Sergeyevich Gorbachev (born 2 March 1931) was the seventh and last General Secretary of the Communist Party of the Soviet Union, serving from 1985 until 1991, and the last head of state of the USSR, serving from 1988 until its collapse in 1991. He was the only Soviet leader to have been born after the October Revolution of 1917. In 1989, he became the first Soviet leader to visit China since the Sino-Soviet split in the 1960s. Gorbachev, Mikhail Sergeyevich born in the agricultural region of Stavropol, Gorbachev studied law at Moscow State Univ., where in 1953 he married a philosophy student, Raisa Maksimovna Titorenko (1932?–99). Returning to Stavropol, he moved gradually upward in the local Communist party. In 1970, he became Stavropol party leader and was elected to the Supreme Soviet of the USSR. Regarded as a skilled technocrat and a reformer, Gorbachev joined (1978) the Communist party secretariat as agriculture secretary, and in 1980 he joined the politburo as the protégé of Yuri Andropov. After Andropov's ascension to party leadership, Gorbachev assumed (1983) full responsibility for the economy. Following the death of Konstantin Chernenko (Andropov's successor) in 1985, Gorbachev was appointed general secretary of the party despite being the youngest member of the politburo. He embarked on a comprehensive program of political, economic, and social liberalization under the slogans of glasnost (“openness”) and perestroika (“restructuring”). The nuclear disaster at Chernobyl (1986) forced Gorbachev to allow even greater freedom of expression. The government released political prisoners, allowed increased emigration, attacked corruption, and encouraged the critical reexamination of Soviet history. A newly created (1989) Congress of People's Deputies voted in Mar., 1990, to end the Communist party's control over the government and elected Gorbachev executive president. During 1990 and 1991, however, the reform drive stalled, and Gorbachev appeared to be mollifying remaining hardliners, who were disgruntled over the deterioration of the Soviet empire and increasing marginalization of the Communist party. An unsuccessful anti-Gorbachev coup by hardliners in Aug., 1991 (see August Coup), shifted greater authority to the Russian Republic's president, Boris Yeltsin, and greatly accelerated change. Gorbachev dissolved the Communist party, granted the Baltic states independence, and proposed a much looser, chiefly economic federation among the remaining republics. With the formation of the Commonwealth of Independent States (CIS) on Dec. 8, 1991, the federal government of the Soviet Union became superfluous, and on Dec. 25, Gorbachev resigned as president. Since 1992, Gorbachev has headed international organizations; written several books, including On My Country and the World (tr. 1999), and run unsuccessfully (1996) for the Russian presidency. Extras : Gorbachev's wife, Raisa, was a highly visible part of his international travels; she died in 1999. Gorbachev, who was sometimes called "Gorby" in the press, was awarded the Nobel Peace Prize in 1990. His fiercest political rival from the left was Boris Yeltsin, who became the first president of the new Russian Federation in 1991. 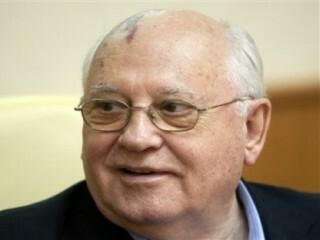 Gorbachev had a prominent "port wine stain" birthmark on his scalp above his right eye; it was sometimes airbrushed out of official photographs. Some experts suggest that one reason Gorbachev was not a popular president was his restriction on the manufacture and distribution of alcohol, especially vodka. In his official online biography, this is given as the explanation for the collapse of the USSR: "Destructive social and ethnic developments, which the emerging Soviet democracy was unable to curb, eventually led to the disintegration of the multinational Union of republics that Gorbachev led". His memoir, Life and Reforms, was published in 1995. Following his resignation and the collapse of the Soviet Union, Gorbachev remained active in Russian politics. During the early years of the post-Soviet era, he expressed criticism at the reforms carried out by Russian president Boris Yeltsin. When Yeltsin called a referendum for 25 April 1993 in an attempt to achieve even greater powers as president, Gorbachev did not vote and instead called for new presidential elections. Following a failed run for the presidency in 1996, Gorbachev established the Social Democratic Party of Russia, a union between several Russian social democratic parties. He resigned as party leader in May 2004 following a disagreement with the party's chairman over the direction taken in the 2003 election campaign. The party was later banned in 2007 by the Supreme Court of the Russian Federation due to its failure to establish local offices with at least 500 members in the majority of Russian regions, which is required by Russian law for a political organization to be listed as a party. Later that year, Gorbachev founded a new political party, called the Union of Social-Democrats. In June 2004, Gorbachev represented Russia at the funeral of Ronald Reagan. Gorbachev has also appeared in numerous media events since his resignation from office. In 1993, Gorbachev appeared as himself in the Wim Wenders film, Faraway, So Close!, the sequel to Wings of Desire. In 1997, Gorbachev appeared with his granddaughter Anastasia in an internationally-screened television commercial for Pizza Hut. The U.S. corporation's payment for the 60-second ad went to Gorbachev's not-for-profit Gorbachev Foundation. In 2007, French luxury brand Louis Vuitton announced that Gorbachev would be shown in an ad campaign for their signature luggage. On June 16, 2009, Gorbachev announced that he had recorded an album of old Russian romantic ballads entitled Songs for Raisa to raise money for a charity dedicated to his late wife. On the album, he sings the songs himself accompanied by Russian musician Andrei Makarevich. In the decade that followed the Cold War, Gorbachev opposed both the U.S.-led NATO bombing of Yugoslavia in 1999 and the U.S.-led Iraq War in 2003. On 27 July 2007, Gorbachev criticized U.S. foreign policy: “What has followed are unilateral actions, what has followed are wars, what has followed is ignoring the U.N. Security Council, ignoring international law and ignoring the will of the people, even the American people,” he said. That same year, he visited New Orleans, a city hard-hit by Hurricane Katrina, and promised he would return in 2011 to personally lead a local revolution if the U.S. government had not repaired the levees by that time. He said that revolutionary action should be a last resort. Russia did not want this crisis. The Russian leadership is in a strong enough position domestically; it did not need a little victorious war. Russia was dragged into the fray by the recklessness of the Georgian president, Mikheil Saakashvili... The decision by the Russian president, Dmitri Medvedev, to now cease hostilities was the right move by a responsible leader. The Russian president acted calmly, confidently and firmly... The planners of this campaign clearly wanted to make sure that, whatever the outcome, Russia would be blamed for worsening the situation. The West then mounted a propaganda attack against Russia, with the American news media leading the way. In September 2008 Gorbachev announced he would make a comeback to Russian politics along with a former KGB officer, Alexander Lebedev. Their party is known as the Independent Democratic Party of Russia. He also is part owner of the opposition newspaper Novaya Gazeta. On 27 March 2009, Gorbachev visited Eureka College in Eureka, Illinois which is the alma mater of former president Ronald Reagan. He toured the campus and later traveled to Peoria, Illinois as the keynote speaker at the Reagan Day Dinner. View the full website biography of Gorbachev Mikhail.